This 1910-15 catchers mitt is a cool vintage piece despite the missing wrist strap and a hole in the palm showing padding beneath. The wrist protector was also slightly ripped at the left and torn off at the right end by about an inch where a belt loop was originally positioned. There is a little remnant of the wrist strap still sewn on at the right side. By some miracle, I had an intact buckle and strap from my box of parts that matched the old sewing pattern. I also had an old pair of old white leather garden gloves from a flea market that matched the patina of the white leather wrist protector. I backed the wrist protector with a glued on piece of vintage canvas that I left long on the right end so I could extend the length of the wrist protector with a piece from the old garden glove. The color and texture match was good. This was actually the hardest part to finish because it was fairly detailed. I resewed along the perimeter edge to match the way it originally looked. The resewing of the buckle and strap was straightforward since I had the old sewing pattern to go by. I glued a piece of canvas backing inside the hole in the palm of the mitt. I cut out a paper pattern of the hole shape and transferred the pattern to a vintage piece of leather that matched the surrounding color and texture of the palm. I glued the leather piece in with contact cement. 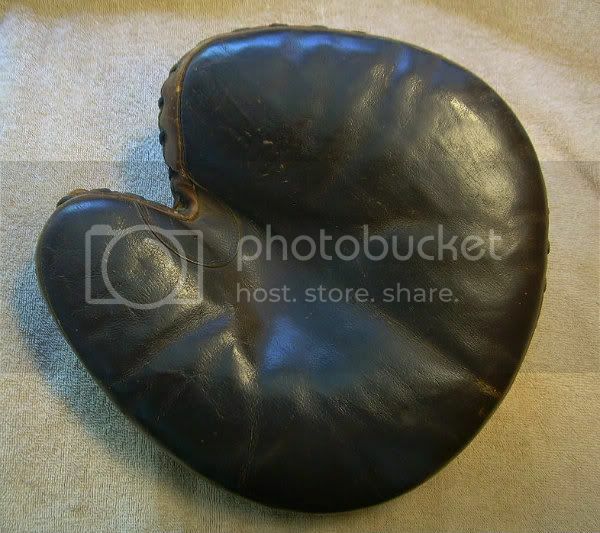 The light brown of the palm is a suede like material and the mitt is very soft on the hand. the mitt has those nice vintage reinforcing rivets at each side of the wrist opening that were still intact. The front of the mitt was pristine and had that nice reinforcing tongue of leather between the thumb and body. 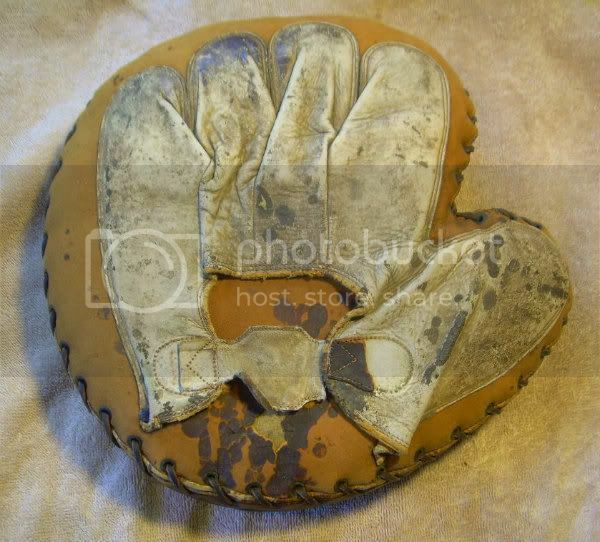 I liked working on this mitt since it had a lot of potential to be turned into a nice display piece. Great job Mike ... I can't wait to see it! 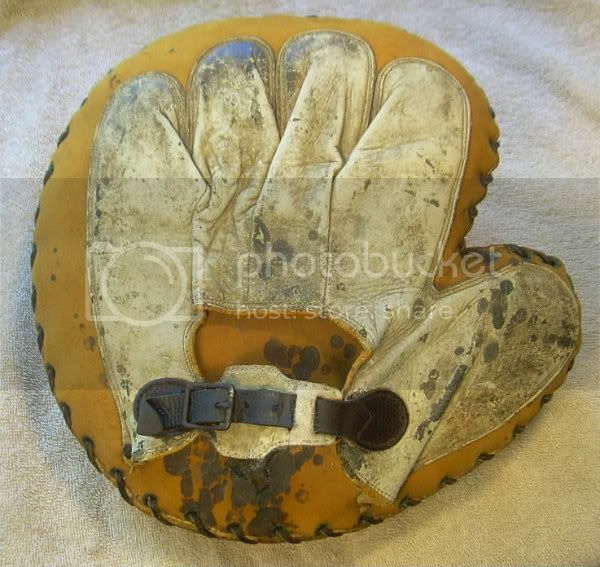 As I mentioned to Mike, this particular glove has a lot of sentimental value to me. I picked it up in the my early days of collecting at an antique flea market outside of Toronto, after a week of being shutout all over upper New York. I was staying in Rochestor for a week on business surrounded by two weekends of glove hunting trips. The first was a trip to Cooperstown -- my first and only to date -- and instead of taking main routes I took back-highways all the way, stopping at every antique shop along the way, big or tiny. I didn't get a darn thing, except for a speeding ticket right out of Cooperstown (hello speed trap). Cooperstown was nice, but there really were no affordable gloves available. I actually had a good visit with Liam O'Bannon on the way back where I picked up a glove, but longed for a nice glove find on my own. The next weekend I took another spontaneous trip to Niagra Falls and Toronto, again stopping at every antique area along the way. Still nothing. I heard about an antique flea market an hour or so north of Toronto, so I left Toronto in the wee early hours in time to make it to the fairgrounds before dawn, only to come upon a big sign that it was canceled. Argh! I drove all the way back, and then heard about an antique show an hour or so west of Toronto. I headed out there and waited in line for the 9:00AM opening, but there were only 20 or so dealers in a high school gym with absolutely nothing of interest. Nothing, and that is saying something. Right as I was about to leave I told one of the dealers about my experience for the day, and he said that I should have just gone to the outdoor flea market down the road (closer to Toronto). All of my previous experience had been that if you arrive after 8:00AM you aren't going to find a darn thing, but decided to go anyway. Long story short, this place was a dream field. It ended up being the best day I ever had for finding mass quantities of decent priced quality items. I remember being envious of all those pictures of you guys after Brimfield with trunks filled with goodies, but had never really experienced anything close until that day (and haven't since). I bought some eight or so gloves, four bats, 3 masks, and a couple framed pictures, most of which were keepers. I was truly amazed and still often wonder what I must have missed out on earlier in the day (and kick myself for passing on other things). The pictures don't do this mitt justice because it is massive, but it is my prized pickup from that trip and the item that I'll always keep as my Cooperstown/Toronto souvenier. And now it's whole. Thanks again Mike! Rob I live just over 1-1/2 west of Toronto. Was the outdoor flea market at Aberfoyle? If so i have been there many times and haven't found too many baseball items. Congrats on your good fortune! I have no clue ... I was like a ping pong ball bouncing all over the place. I really enjoyed Toronto, though. Aberfoyle sounds familiar but it could be because more recently I played golf in Aberdove (Wales). I remember it was just an open field where you parked anywhere and the vendors were not evenly spaced. That was part of the coolness to me because our flea markets are pretty regimented on pavement. My purchases were from multiple vendors and all were open to haggling. Maybe it was a dream. When going back across the border when the officer asked me if I had anything to declare I responded, "yes, all kinds of great antique baseball items." He shook his head and let me go on my way. 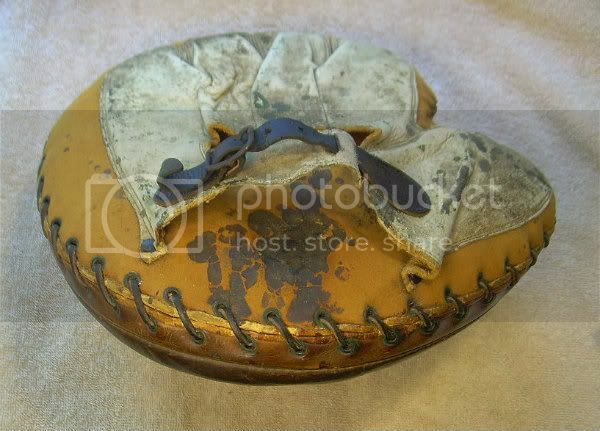 Besides perusing JD's site for a guide for the wrist protector on this mitt, I found this 1910 patent from Goldsmith. I couldn't find any manufacturers identification on Rob's mitt but the way the buckle strap attachment was integrated with the protector was pretty much just like the patent drawing.